I saw a lot of great theatre in 2018 from all over the world, and will be writing a bit more about it here soon. However, if you are looking for a bit of good news to launch the new year, look no further than the announcement that one of my top ten picks is still available! Patrick Dooley’s sublime production of Tom Stoppard’s Arcadia has extended through Jan 27 at Shotgun Players in Berkeley. For those who love the theatre of words and ideas, Stoppard’s play is always a treat, but Dooley’s production exceeds expectations in every way. Max Forman-Mullin as Septimus Hodge; Amanda Ramos as Thomasina Coverly. All photos by Ben Krantz Studios. Why is a Shakespearean writing about Stoppard? 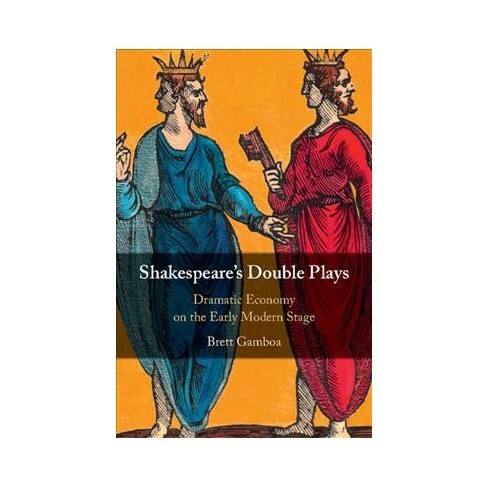 An aside: My usual beat is early modern drama, especially Shakespeare, and although I like a lot of other plays and periods, I rarely write about modern drama. The reason for this is simply that the dividing line between pre-modern and modern drama is usually drawn at the advent of realism where plays suddenly start being about characters who are psychologically complex but generally inarticulate about their feelings and may not understand their own motivations. 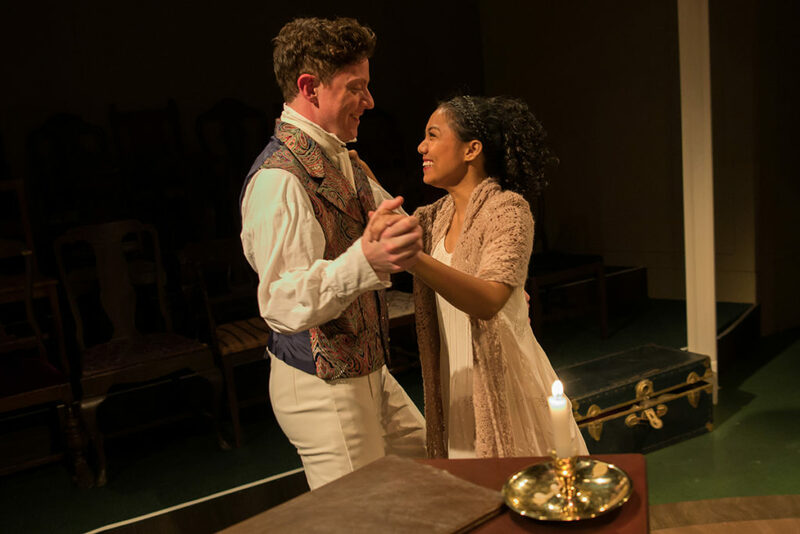 Jessma Evans as Hannah Jarvis, Gabriel Christian as Valentine Coverly; two characters in the modern scenes of the play who struggle to understand and express themselves. My critical expertise falls on the other side of that line, with characters who are brilliantly (if unrealistically) expressive and articulate–to the point that they can sometimes put their thoughts into verse with healthy doses of rhetorical flourishes thrown in. In short, I write about performance of heightened language. 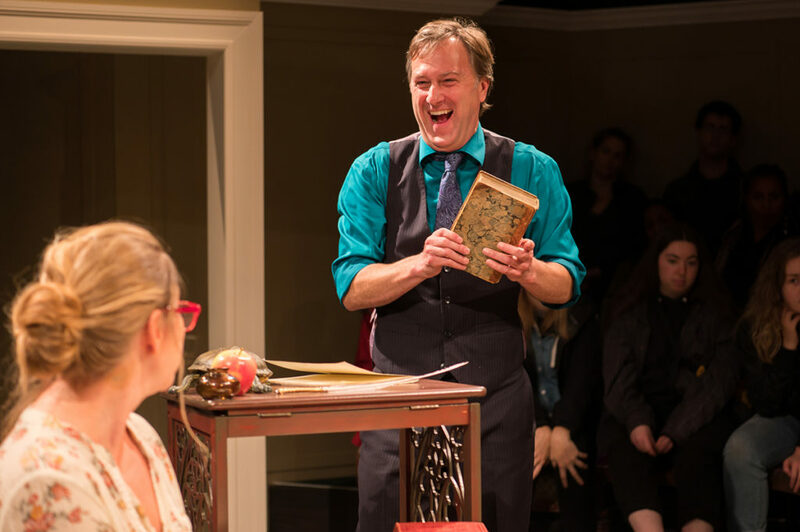 Usually the line falls more or less historically at the advent of the twentieth century, but in 2018, I saw two productions (both in Berkeley) of modern plays with linguistic brilliance that rivaled that of any classic. In the summer, Tony Kushner’s Angels in America at Berkeley Rep (with the amazing Stephen Spinella, the original Prior Walter, in role of Roy Cohn) was a–no pun intended–revelation. Surprisingly, given the very different level of resources available and invested, Shotgun Players’ late winter production of Arcadia was completely on par with the Rep’s Kushner. 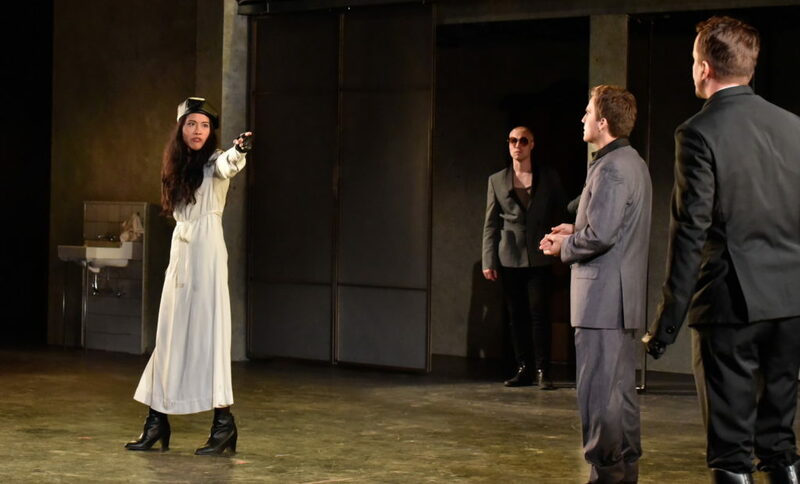 Shotgun’s company of exceptional actors, especially Max Forman-Mullin as Septimus Hodge and Amanda Ramos as Thomasina Coverly, invested in Stoppard’s non-stop wordplay (see what I did, or at least tried, there?) with wit, agility and stunning emotional honesty. 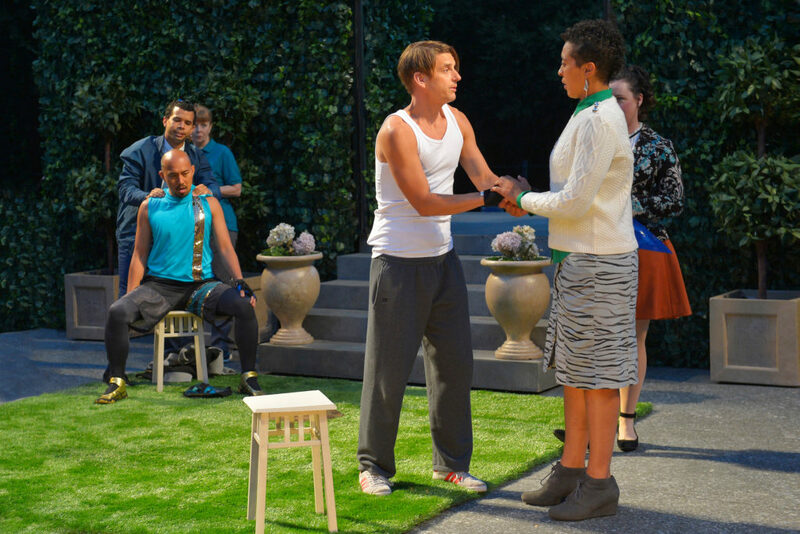 Amanda Ramos as Thomasina Coverly and Max Forman-Mullin as Septimus Hodge on Deanna L Zibello’s set with audience seated directly on the stage surrounding the players. Patrick Dooley’s brilliant direction found every nuance in this incredibly complex plot and made it look easy, which I know from having directed this play myself, is not. In an extraordinary director’s note, Dooley emphasized the socio-political implications of the play beyond its dazzling theme and variations on love and lust, which brought even greater contemporary resonance to a play already considered a modern masterpiece. Shotgun is a special place, and this production capitalizes on all their strengths. Their space is intimate, and made more so for this production. Rows of audience are set up on stage to create an arena staging, putting even more audience members right next to the action. The cast is as good as they have ever assembled, under their founding artistic director, who assembles very good casts. Most of all, however, is the experience of seeing this play with Shotgun’s loyal, and let’s face it, exceptional audience. The level of familiarity with this play and knowledge of the huge range of subject matters it deals with, from the history of English landscape gardening, to the poetry and personal exploits of Lord Byron, and on to modern fractal geometry, was astonishing. Aaron Murphy as Bernard Nightingale, a contemporary “expert” on Lord Byron. A theatre is not just the artists and staff, it is also the community that they create. It is a different experience to see a play with an audience this receptive and perceptive–one to be relished. The play was sensitively interpreted by set designer Deanna L. Zibello’s minimalist arena aided greatly by the work of prop designer Devon Labelle, costume designer Brooke Jennings’ nicely coordinated period and modern costumes, lighting designer Sarina Renteria’s clever rendering of time, and Cliff Caruther’s sound design. I suspect that an unsung hero of the production might be dramaturg Dave Garrett. Shotgun’s charming company photo, showing the complete cast and crew–emphasizing the collaborative nature of this company. Get your year started right–go see this play. I assure you it will make you feel better about the times we live in, the state of the theatre, and the bright futures of some exceptional artists. Shakespeare’s plays are undoubtedly great literature, but it is easy to forget that they are also amazing acting machines. 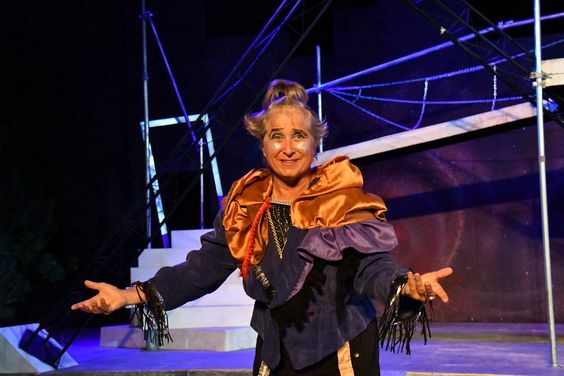 The Arabian Shakespeare Festival’s current Twelfth Night is so full of virtuoso performances, including some very unexpected casting and doublings, that I am reminded again that when you bet big on the actors, small is beautiful. 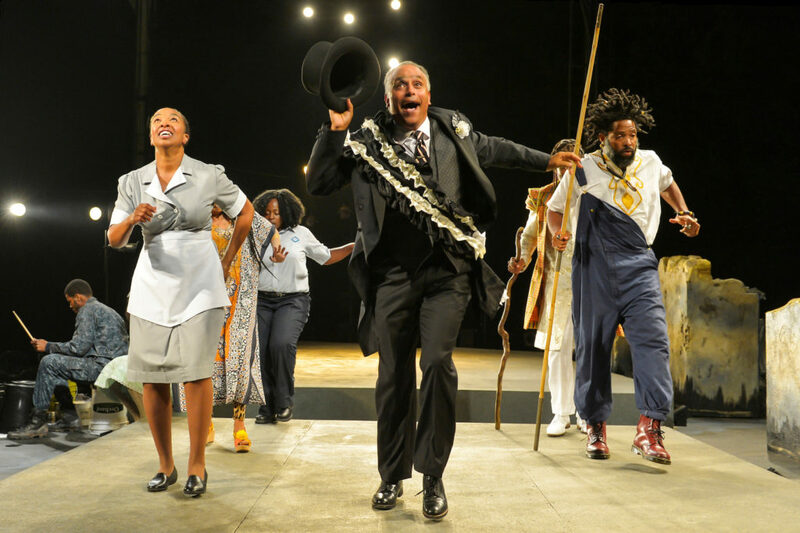 This is ASF’s first foray into Shakespeare’s comedies, after a series of performances of tragedies I admired–especially a conceptually brilliant Othello in 2014. I was not sure how their house style and mission might adjust to this switch. Any doubts I might have had were almost instantly swept away by the sheer joy of playing exhibited by the charming, versatile and skillful cast of six. 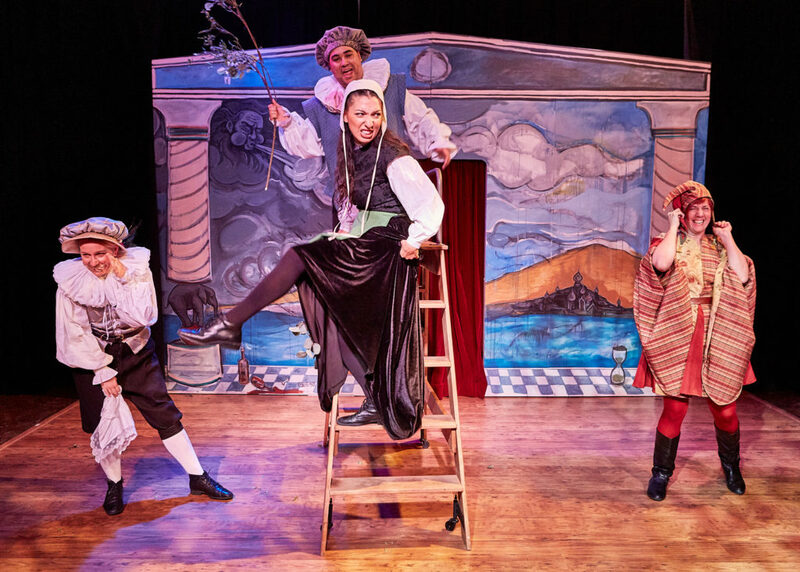 (l to r) Sir Andrew (Jennifer Le Blanc), Sir Toby (John R. Lewis), Maria (Livia Gomes Demarchi), and Feste (Rebecca Pingree) celebrate as their schemes come to fruition, in Arabian Shakespeare Festival’s production of Twelfth Night. 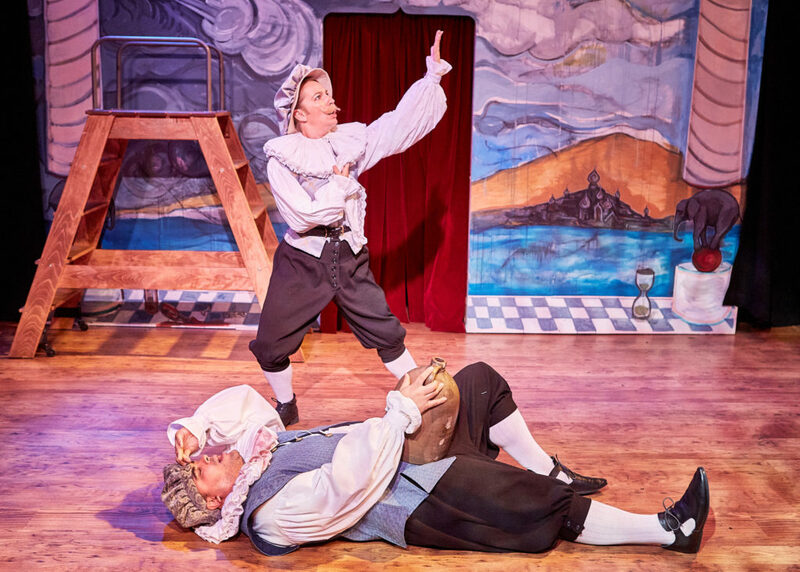 Twelfth Night is one of the middle comedies, with twenty roles in the cast list. I’ve seen wonderful productions of the play that were produced with a one actor/one role casting scheme. In these, the bittersweet story of a pair of separated twins (each believing the other lost at sea) who slowly work their way back to a reunion, the overthrow of a puritanical steward standing in the way of pleasure, and the surprising manner in which the courtship of a grieving countess by an admiring Duke ends in happily in marriage–just not to each other, was always satisfying. That is one layer of delight and it can be enough, in and of itself. 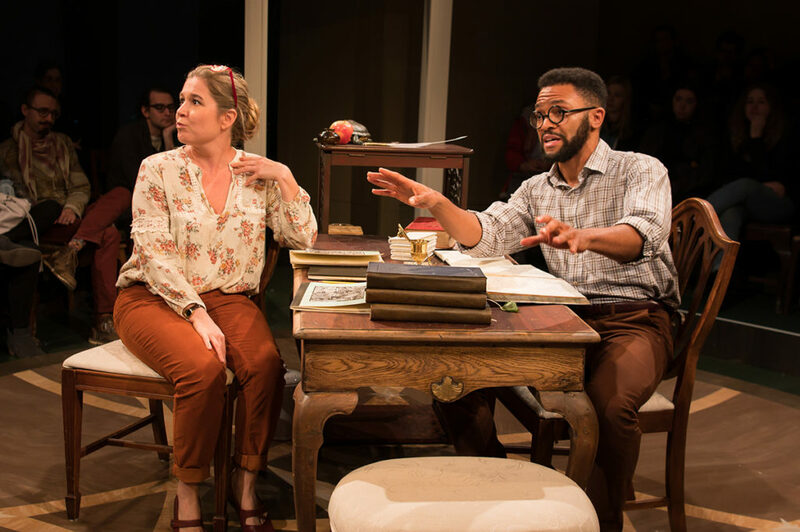 ASF’s production, insightfully designed and directed by Audrey Rumsby, sounds all those notes, but it has many more layers in play that make it much more than the sum of those parts. Rumsby’s set design, echoing the central prop in the play, a toy theatre/music box, turns the Royce Gallery’s tiny playing space into a virtue. We know from her concept that we are seeing an imaginative romp. It invites us to think of the play as literal “play,” a game in progress. Elizabeth Smith’s whimsical costume designs capture the essence of each character, which is crucially important since actors quickly switch from one role to another with additions or subtractions of only a piece or two. The cast uniformly delivers on the promise of this premise! 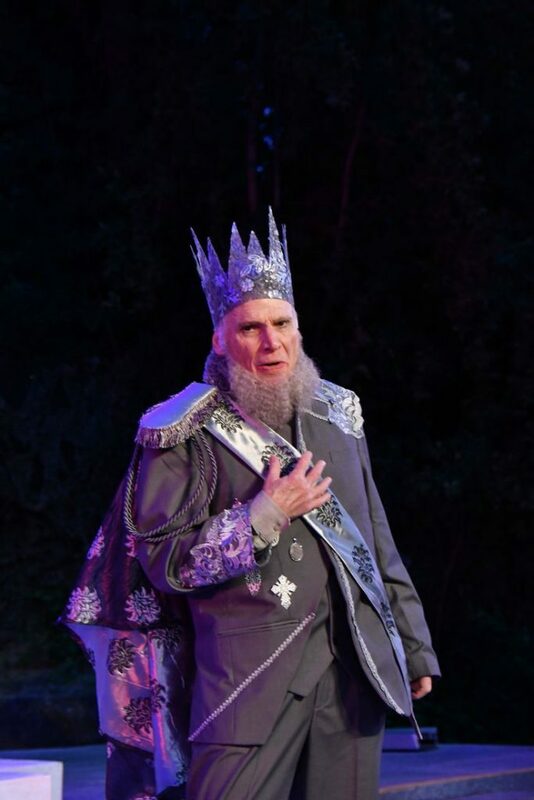 John R. Lewis is a dignified and outstanding, if unconventional, Duke Orsino, but with the addition of a big, winestained ruff he transforms into Orsino’s antipode, the perfectly-named drunken reprobate, Sir Toby Belch. Watching him switch back-and-forth is enchanting above and beyond anything that he does in either role–a layer of pleasure that you don’t get in a conventional staging. 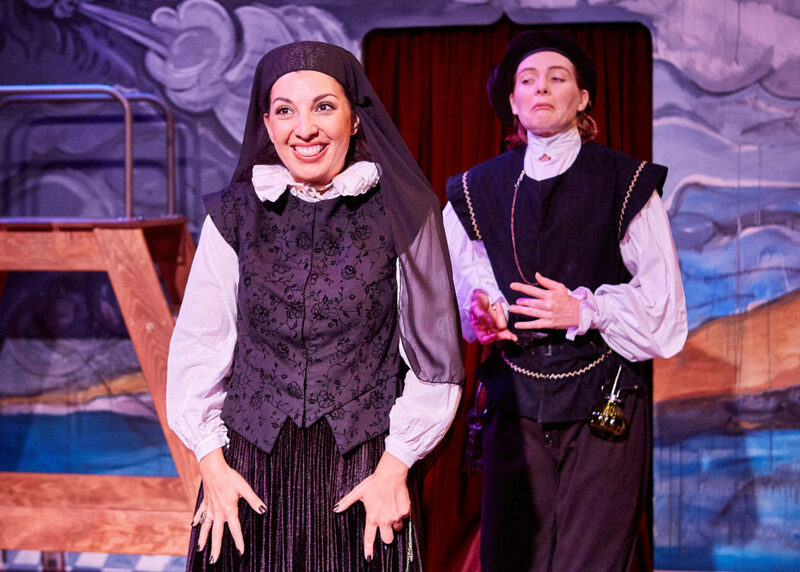 Rebecca Pingree raises the bar higher in her main role as the jester, Feste, as she demonstrates some serious musical chops in addition to her acting skills. (The whole production, in fact, is filled with excellent live music performed by the cast, under the musical direction of Lindsey Schmeltzer.) Very early on she doubles the usually forgettable role of the unnamed “Captain” in a surprisingly convincing masculine portrait, but reserves her comic firepower for a thoroughly confused (and confusing) priest in the play’s finale. She is terrific in all three parts. (l to r) Viola (Kate Rose Reynolds) prepares to fight a duel with Sir Toby (John R. Lewis), as Feste (Rebecca Pingree) look on. Amelia Adams grounds her portraits of the male twin, Sebastian, and the insufferable puritan Malvolio in the physical techniques of Commedia dell’Arte. Neither role is realistically convincing, nor meant to be. (ASF could have cast a male actor, after all, if that was the goal.) Instead, both parts are suffused with deep observational insights about how we construct “leading men” and “the authority of male privilege” that can only be conveyed to an audience when they are obviously put on, instead of inherent in the actor. Livia Gomes Demarchi plays two female roles at opposite ends of the “leading vs. character women” spectrum. As the Countess Olivia she is proud in declining the proffers of love from Duke Orsino but reduced to a quivering jelly in the presence of “Cesario,” whom she adores without realizing she is pursuing a disguised woman. As Maria, the pragmatic, scheming lady-in-waiting she is almost unrecognizable as the same actress although all that has really changed is the addition of a bonnet. Kate Rose Reynolds plays the afore-mentioned twin-in-disguise, Viola/Cesario, (in both her female and male forms) with panache. This is the only “doubling” built into the play, and if it is unsurprising, it is no less entertaining because we see it in the context of a whole shape-shifting cast. I’ve seen an awful lot of “Cesarios” whose entire characterization appeared to be wearing a hat, but Reynolds seriously explores the mental transformation of her character when she assumes the male persona for protection. Hers is the most insightful Viola of my experience. 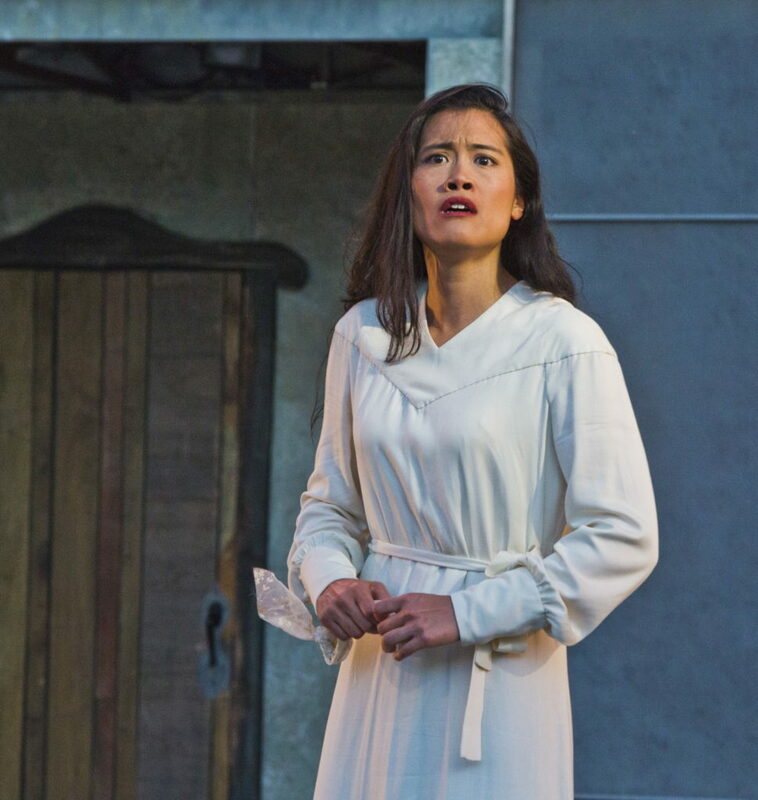 The actor in the announced cast with which I was most familiar previously was Jennifer Le Blanc, whose Desdemona for this company thrilled me. I was so disappointed to see that she would be playing two minor parts, neither of which seemed to me to make particularly good use of her talents: Sir Andrew Aguecheek, and the dedicated (probably lovesick) protector of Sebastian, the sea captain Antonio. I saved discussion of her performance for last, because I could not have been more wrong. She was astonishing–hysterically funny and heartbreakingly serious by turns–all night long. I found myself desperately racing ahead through the play’s scenes in my mind thinking about how soon I would see her again any time she left the stage. The virtuosity of the performances, of the transformations, and of the ensemble work was exemplary. Above all, her joy in playing the roles was palpable. ASF’s production is intimate. The space is small. The cast is reduced to just six players. The set and costumes are simple. The means are limited but the pay-off is huge. The play is actually MORE enjoyable because of the imaginative and versatile way that it is produced. I admire this company and have championed their work in the past, but now I have to say that as it matures it improves. If you love Shakespeare, go see this production. If you love the theatre, go see this production. If you want to deeply understand why Shakespeare is the quintessential theatre artist, do not miss this production! There aren’t many seats. Get one while you can. This review is of the Sunday, Nov. 4 performance. 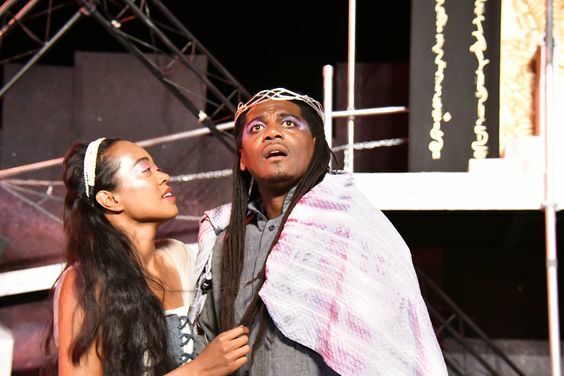 A Tale of Two Hamlets: A review of the Arabian Shakespeare Festival Production. 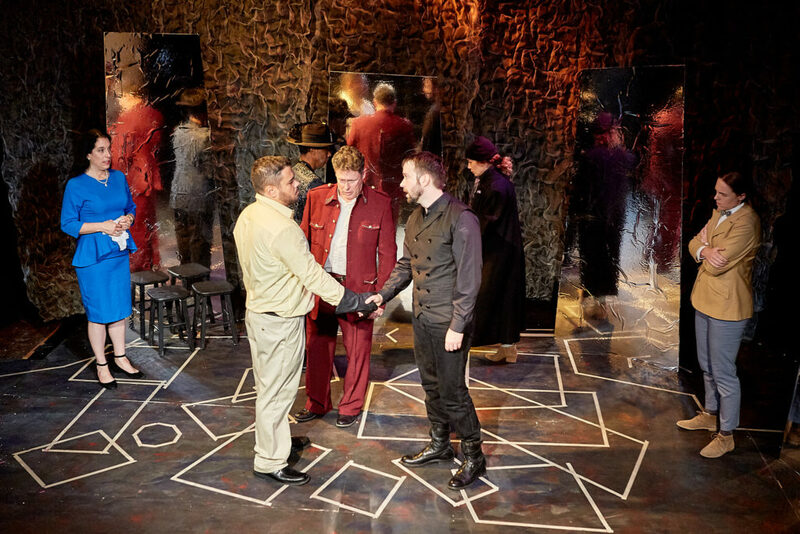 At the center of the Arabian Shakespeare Festival’s current production of Hamlet are exceptionally insightful and original performances by William J. Brown III as the title character and Nathaniel Andalis as his bête noir and foil, Laertes. Without directly saying so, the production sidelines the more conventional antagonist, Claudius, with all-too-relevant implications. The cast of Hamlet, with Nathaniel Andalis as Laertes and William J. 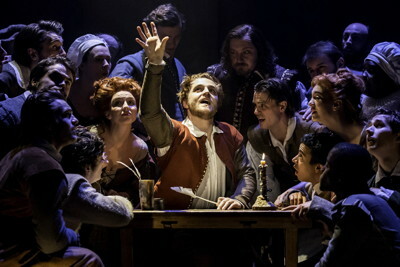 Brown III as Hamlet in the Foreground, John Flanagan as Claudius between them and Rachel Bakker as Gertrude, Norman Gee as Osric, Emily Keyishian as a courtier and Kate Rose Reynolds as Horatio looking on. Of course, no play is thought to be so “universal” as Hamlet, so it is no surprise that any reading seems somehow current. Nonetheless, a focus on Hamlet’s disgust at the weakness of the current leader in comparison to his immediate predecessor, and his incredulity that anyone (let alone everyone) fails to see it, is so pregnant with contemporary implications that the production positively boils with renewed urgency. John Flanagan plays Claudius as a weak and self-important ruler, so it is instantly believable when the play reveals he sleazed (rather than powered) his way into the job. 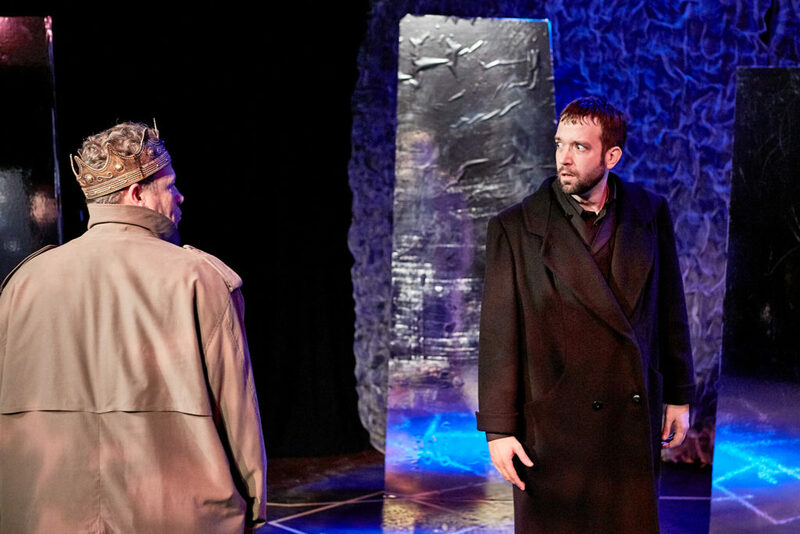 Hamlet is too well-known for Claudius’ guilt to surprise anyone, but in this case, the production dwells on the patient investigation necessary to bring it into the open. Something IS rotten in Denmark, and everyone knows it, but out of pure self-interest no one will be the first to say so. William J. 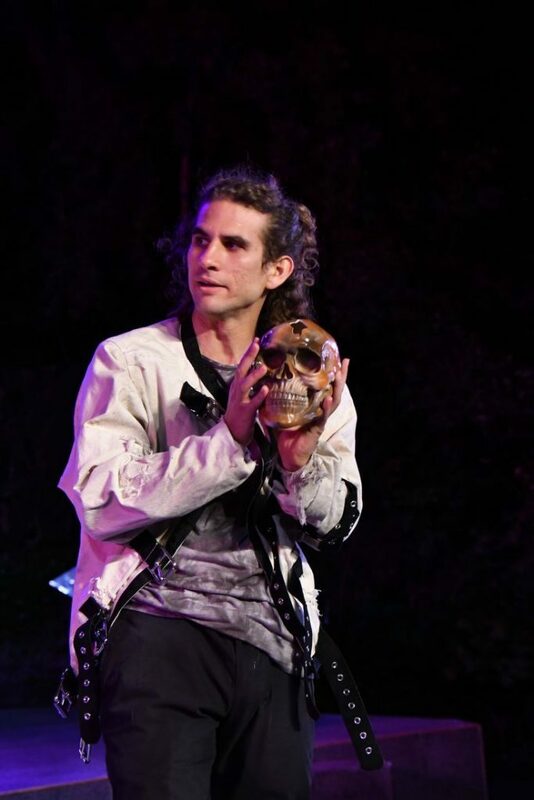 Brown III as Hamlet, with John Flanagan as the Ghost. Photos by Gregg Le Blanc. Brown’s Hamlet is the opposite of the traditional conflicted and dithering naïf. This Hamlet is on the edge of rage from beginning to end. He has to fight for control of his passions, and struggles to apply the rationality he knows the situation demands if he wants justice and not just revenge. Brown is an exceptionally intelligent actor. His delivery of Hamlet’s famous soliloquies is slow and meticulous, but only because his Hamlet is so obviously forcing himself to reason through circumstances where he would rather rampage. In this production the most powerful counter-force is Laertes who, like Hamlet, is another seeker of revenge for his father’s murder. 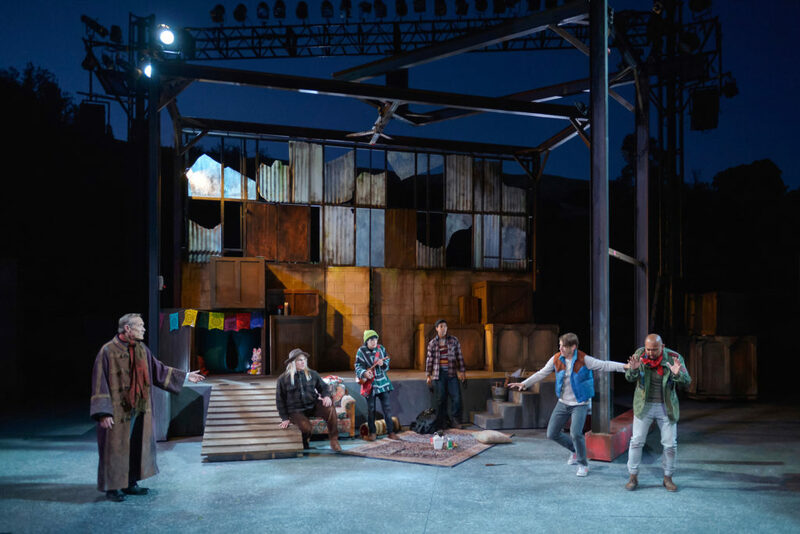 Interestingly, the actor in this role is Nathaniel Andalis, who spent his summer playing the title role for the San Francisco Shakespeare Festival. Andalis is a charismatic performer with exceptionally deep connections to this play. (His bio says that he hopes to play all the roles in the play eventually, and in this production he is half-way to meeting this goal by notching up his seventeen role in the show.) 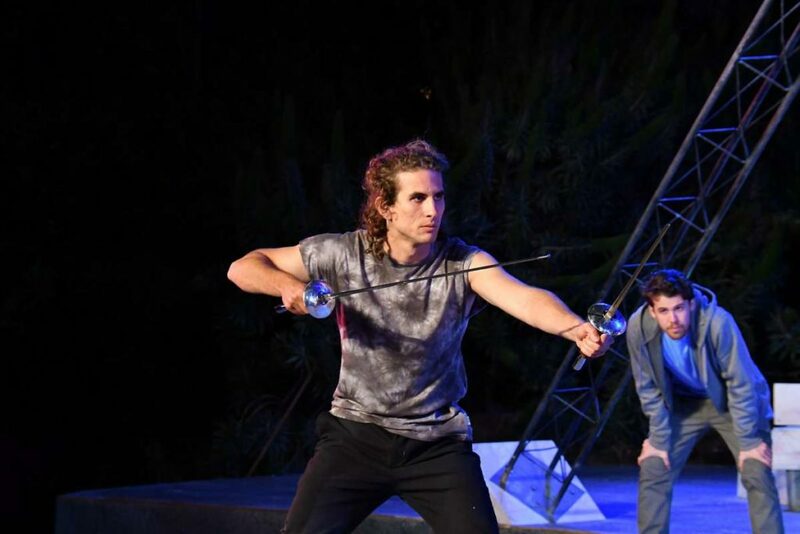 Laertes exists in the show as a “foil,” a subsidiary character whose situation mirrors that the protagonist so that we might see both comparisons and contrasts. I’ve never seen this function so fully executed as it is in the performance Andalis delivers. I attribute this to the fact that he so deeply understands exactly how the role illuminates that of Hamlet, emotionally and thematically, because he brings such deep perception of the title role from his own experience of playing it. In a way, in this production you get to see two Hamlets – and they are both compelling. Placed in opposition to each other, they are explosive. 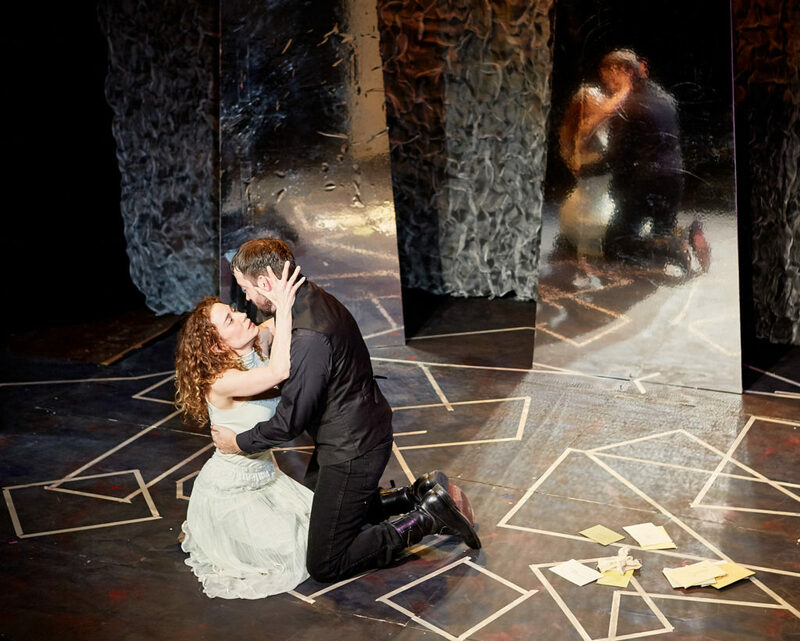 Brown as Hamlet with Emily Keyishian as Ophelia on Malcolm Rodgers reflective set. I am on record as a big fan of this small but interesting company. A couple of years ago they produced an Othello that thoroughly explored the title character as an Arabian Moor that opened completely new aspects of the play for me. Both pre-show publicity and program notes suggest that this Hamlet is also filtered through an Arabian viewpoint – although I do not think this displays overtly or that this information is necessary to appreciating their effort. The play, in fact, seems particularly relevant and compelling for reasons (outlined above) that seem far from the Arabian traditions of political revenge tales that it might be referencing. The obvious political implications as well as the preciseness of the investigation of revengers (in this case doubled because the Laertes is rendered as specifically as the Hamlet) is what makes this production unique. The production is staged by Kevin Hammond, whose work tends to emphasize striking individual moments that don’t always cohere into a big picture. Some of those moments, however, (especially Hamlet’s encounter with Claudius at prayer) are stunningly effective and thought-provoking. Hammond’s greatest contribution was the dramaturgy of the production: The text was both abridged and intriguingly rearranged (into almost collage fashion). The highlight of the night was the exceptional fencing match-turned-duel at the end of the play, choreographed by Andrew Joseph Perez. The fact that we were right on top of it in the tiny (40 seat) Royce Gallery contributed to the sense of danger, but such immediacy worked in the play’s favor here, and throughout the show. Hamlet has a limited run, and there are few seats. If you love this play, this is an interpretation you don’t want to miss, with two stellar performances that you shouldn’t miss. See it while you can. 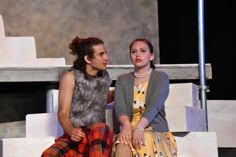 This article has been updated to credit director Kevin Hammond with the dramaturgy, and to include additional photos. This review is of the Nov. 3 performance. Royce Gallery (2901 Mariposa St., San Francisco, CA 94110). Visit www.arabianshakes.org for tickets and more information. Once again, American Theatre magazine lists of most produced plays and playwrights are out. 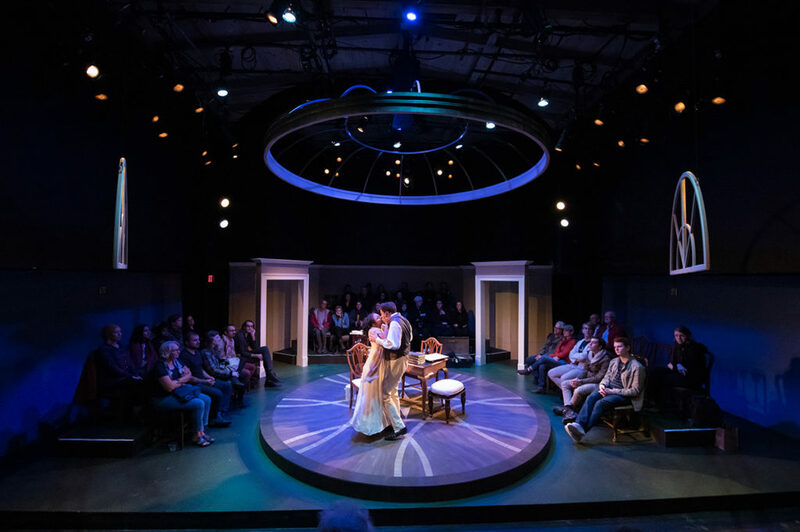 Every season, Theatre Communications Group (TCG) – the organization of America’s not-for-profit theatres – puts out a list of the 10 most produced plays, and top 20 playwrights by its nearly 500 members. Although it covers only a segment of the American theatre scene, (because it does not include for-profit, academic, or amateur theatres) its annual lists are a quick way to get the pulse of what plays and playwrights are currently hot. That is a very useful list for performers thinking about where to put their time and energy familiarizing themselves with scripts, with names to watch, and with sources for audition material. With a total of 108 productions scheduled, our winner, William Shakespeare! BUT…for those who are counting there will 108 productions in America’s professional theaters of Shakespeare’s plays, vs. 27 by Gunderson. Shakespeare, in fact, has more productions scheduled than the top five “official” finishers combined. 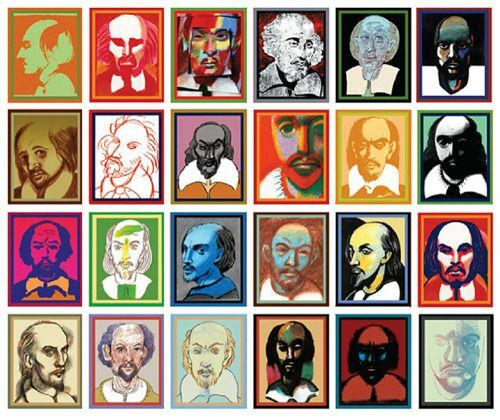 As I try to remind my students regularly, if they are trying to decide where to put their time and energy, they would do well to place their emphasis on Shakespeare. Oh, and one more thing. Next year’s most produced individual play? No, it is not by Shakespeare – but it is about him: Shakespeare in Love is set to receive 15 productions. 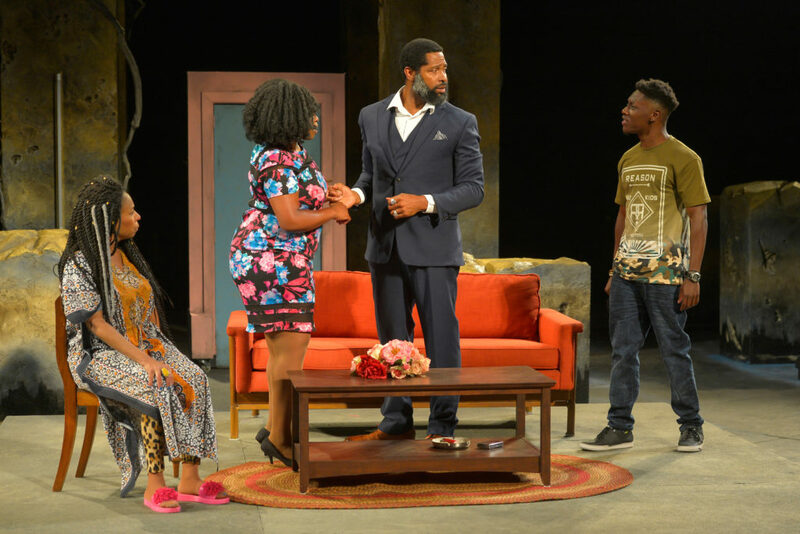 At the center of poet/playwright Marcus Gardley’s black odyssey (now playing at the California Shakespeare Theater) is the eternal impulse to retell a classic tale in order to claim it as one’s own. For those of us who regularly teach the classics, this is the lesson we seek to foster: the purpose of retelling these stories is not to perpetuate the past, but to connect to it. It is impossible to leave Eric Ting’s masterful production without feeling a part of something bigger than one’s own limited space and time. Gardley’s reworking of the Homeric epic gains its force from the paradoxical rule that universality is achieved not by vacuous generality, but in precise specificity. On its surface, his play is about an African-American veteran of the contemporary (and ongoing) war in Afghanistan, named Ulysses Lincoln, who cannot find his way home. Over the course of the evening it becomes clear, however, that he is not so much geographically lost as spiritually at sea. His journey is not just finding his home, but finding himself. After being swept overboard of the ship carrying him home by a wave caused by the vengeful sea god, he washes up on a shore that – we slowly realize – is located both far from his intended destination and decades before he was born. The path to self-knowledge runs through the discovery of a history that was in some ways actively withheld from him through erasure and distortion, and in other ways that he actively fled when he joined the army to get himself out of Oakland. Although this is one man’s specific story, Gardley guides us to seeing beyond the surface, making it also a story about all of us. Like any true epic, the plot is anything but linear. It is dotted with witty reïmaginings of the arbitrary and capricious Greek gods Paw Sidin (Poseidon), Aunt Tina (Athena) and Great Grand Daddy Deus (whose name is pointedly changed from Zeus to the Latin generic term for “god,” presumably because it also applies to the god of Christian tradition) who toy with human fate for reasons of their own. It retains the secondary story of the struggles of his wife, Penelope (here called Nella P.), and son, Telemachus (Malachai in Gardley’s version), to survive and retain hope, while placing them in a very recognizable 21st century Oakland. Often it focuses on the surreal experiences of the wandering Ulysses. Along the way Gardley invokes Hurricane Katrina, the string of assassinations of civil rights leaders, Abraham Lincoln, JFK, Treyvon Martin, the death of Oscar Grant in the Fruitvale BART Station, reconstruction, and a host of other historical and local references that stir times and places together poetically. Painfully, I saw the opening night performance just hours after a white supremacist march in Charlottesville, Virginia, erupted in fatal violence against counter-protesters, which did not need to be directly referenced in order to be part of the mix. Gardley is as much poet as playwright. His rhythms, rhymes and wordplay are both stunningly current and historically apt. For anyone who loves language black odyssey is a feast. 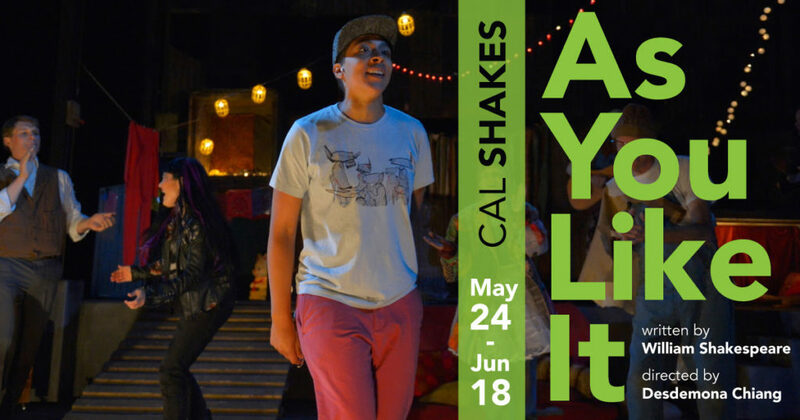 CalShakes consistently demonstrates careful attention, not only to what is said, but how it is said. Gardley is at his most Homeric in his extravagant use of poetic artifice, and the producing company serves his inventive wit well. The production heavily features music, especially arrangements of traditional spirituals. Vocal composers Linda Tillery and Molly Holm produced the strongest musical ensemble I have seen at CalShakes. (Tillery is also the credited Music Director, while Holm is also listed as Vocal Ensemble Director.) While I was less impressed with the brief forays into pop music in the second act, it is hard to underestimate how much of the overall impact of the production is built on the musical components. When the full cast is united in a choral moment, which happens rather often, the wall of sound they create is viscerally moving. However much all of that matters, the evening is also about basking in the masterful performances of an exceptional cast. As Ulysses, actor/percussionist J. Alphonse Nicholson accomplishes the enormously challenging task of portraying a lost soul without fading from focus or losing his energy. His humanity and generosity as a performer letting us glimpse his innermost self allows us to identify with him intensely. 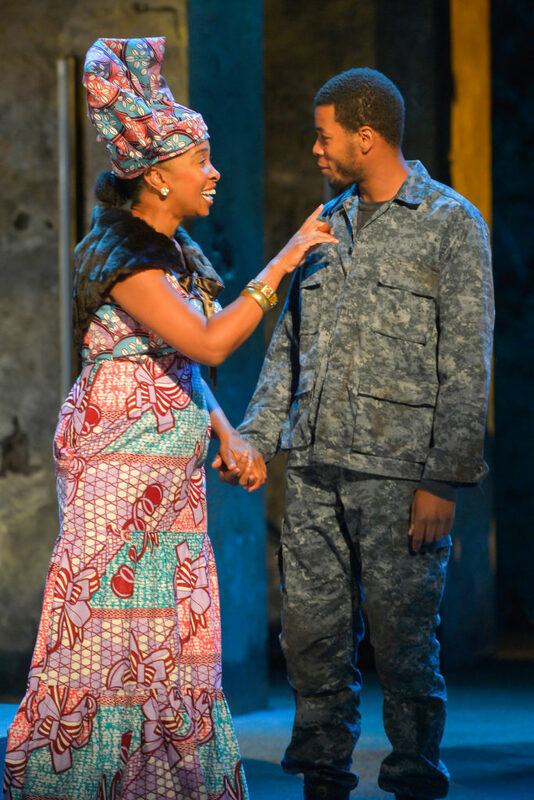 Omozé Idehenre proves an emotional anchor for the entire evening as his long-suffering wife. Newcomer Michael Curry completes the family trinity as his son, Malachai, movingly and believably, even when the role shines an unsympathetic light on his character. In a conventional drama, this family grouping would be our entire focus and we would be content with such central performances. In this cast, however, the peripheral players are every bit as compelling. CalShakes regulars Aldo Billingslea and Margo Hall are powerhouses as the squabbling gods whose conflict lies behind Ulysses’ trials. Both also demonstrate astonishing versatility as they transform into their respective gods’ alter-egos. Billingslea invokes Paw Sidin as a coverall-clad levee fisherman but when he incarnates as a smooth-talking suit salesman wooing Nella P., a crisp military officer offering the wrong kind of solace when he brings news that Ulysses is lost and presumed dead, and a terrifying policeman, he appears completely different in each case. When Hall’s Athena sloughs off her immortality to become Aunt Tina, an aging and ill human, we see her change right before our eyes. And her invocation of Tina Turner (as one of the Sirens) is, well, let’s just say worth the price of admission all by itself. Are these five great performers the magic number? Hardly. They are actually just the start of a cast of astonishing depth. 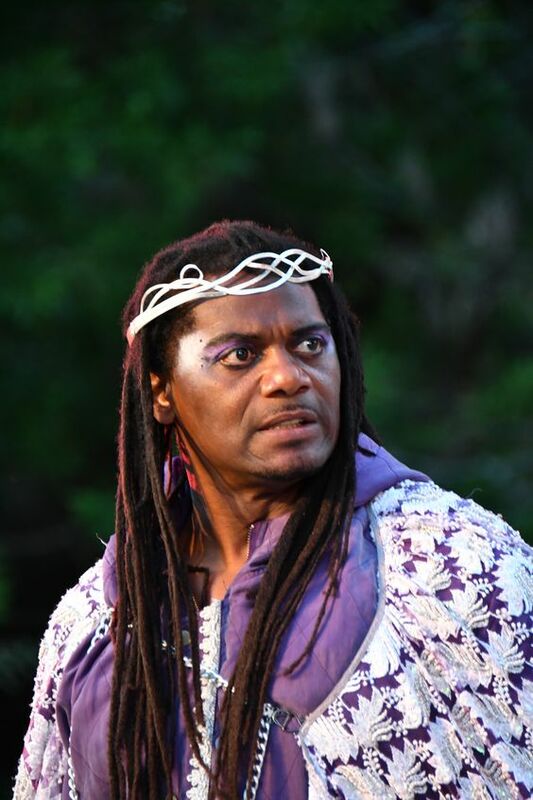 Lamont Thompson as Daddy Deus is majestic, and in various minor roles he ranges from mysterious to hilarious. 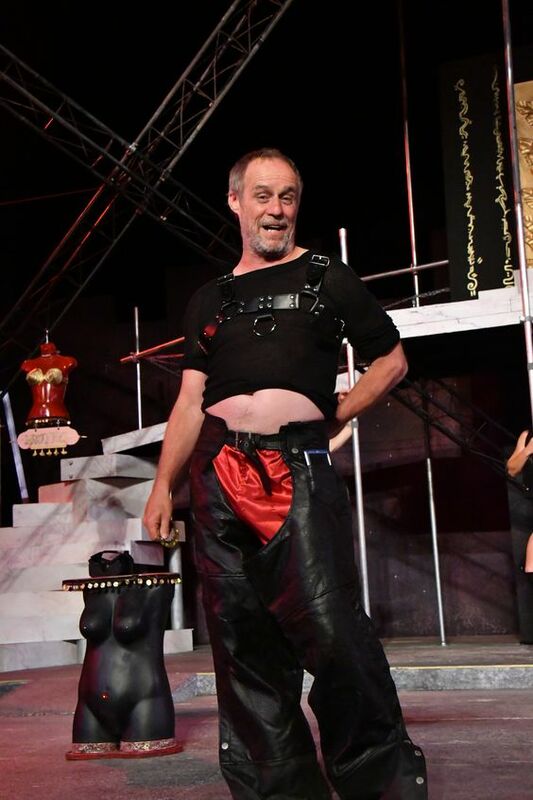 Bay Area playwright/performer Michael Gene Sullivan (best known for his work with the San Francisco Mime Troupe) appears – and sometimes disappears into – so many guises it’s hard to stay clear that it is the work of just one man and not a cast of dozens filling in. Dawn L. Troupe is Sullivan’s female equivalent in the cast playing a range of roles, sometimes prominent and sometimes almost invisible, providing enormous texture and depth to the play. 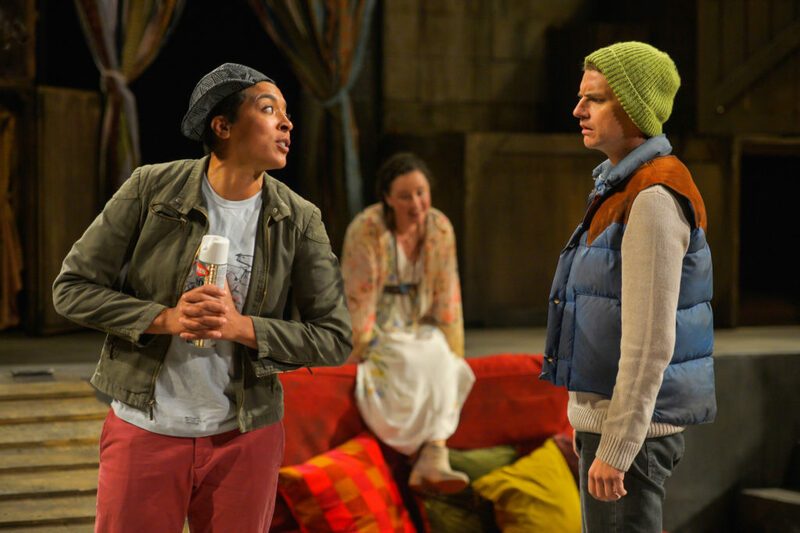 The nine-person cast is rounded out by Safiya Fredericks, whose light and amusing performance of Ulysses’ childish traveling companion conceals an artfulness and control that is only revealed when the entire play has unfolded. It is unfair that her masterful work cannot be discussed in detail without spoiling the play, but it can be said without harm that her genius lies in knowing when and how to unleash her talent, and it is worth the wait. The action of the play happens almost exclusively on an empty platform in front of Michael Locher’s monumental set, but the dynamic visual impression created by the towering (and crumbling) pillars sets the right tone throughout the night. 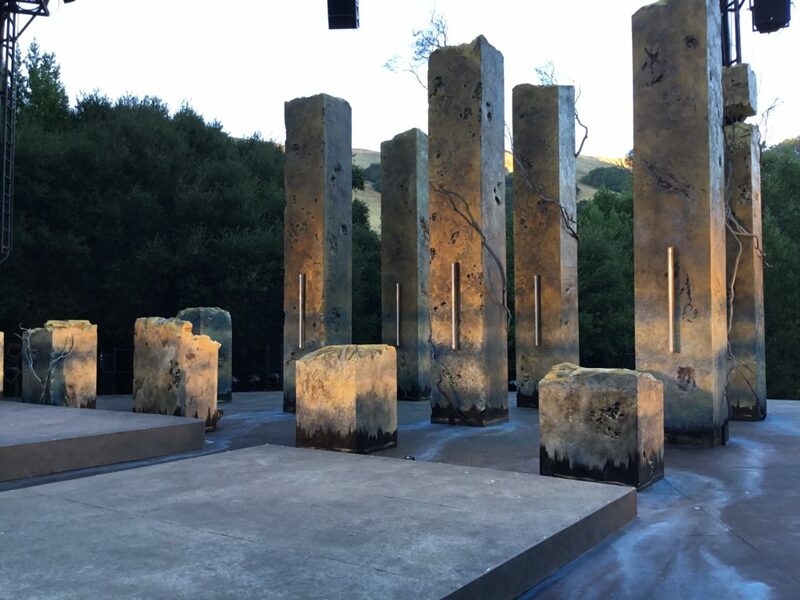 Locher is especially successful at tying the stage space to CalShakes’ astounding natural setting in the Berkeley hills. That gorgeous view is always one of the pleasures of attending a CalShakes production. In a piece this grounded locally, it was especially admirable that the surrounding environment was featured. Abetted by the outstanding work of Lighting Designer Xavier Pierce, both the onstage action and the larger surroundings remain in balance. Thematically evocative, the image of one small man making his way in the huge world could not have been more beautifully rendered. Costumes by Dede M. Ayite successfully mix the mundane (for scenes of domestic depression) and the fantastic (in the otherworldly visions of Ulysses), which is not an easy trick to pull off. Michael Locher’s set lit by the pre-show sunset. Photo by the author. Ting’s directing is an astonishing act of empathy by a man who is, after all, of Asian-American decent, who is empowering an African-American cast to claim and interpret a story whose specifics are outside his direct experience. 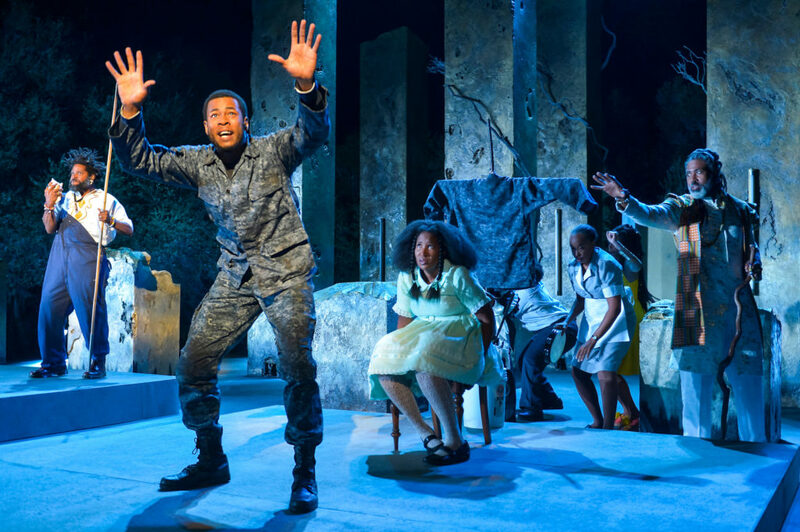 In his company debut as a director a year ago his Brechtian production of Othello proved controversial in part because (as is the way with such productions) we were not so much asked to empathize with Shakespeare’s hero, but told to do so. I am among those who actually like a stern lecture now and then and I liked Ting’s production, but I concede it was more Brecht than Shakespeare. In this case, Ting seems an absolute servant to Gardley’s vision. It is hard for me to imagine that even those who found his Othello difficult will not find this an inviting experience. 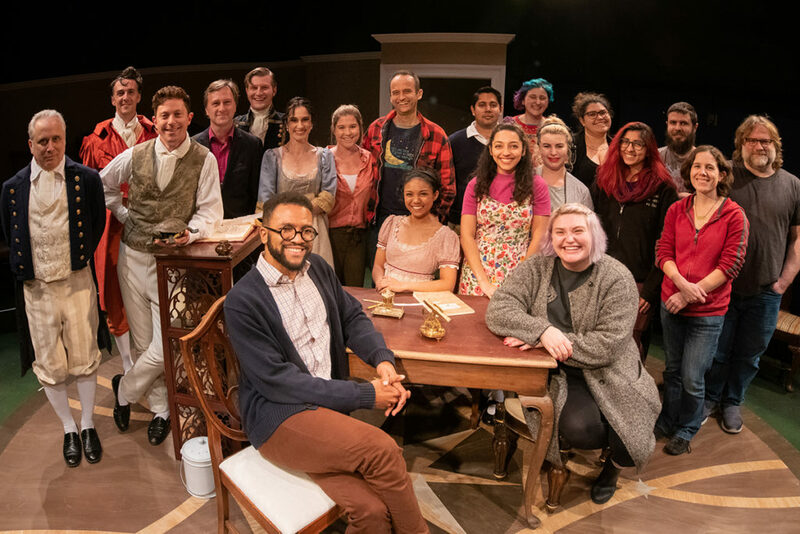 It is a sensitive and insightful rendition of a beautiful play, allowing a local playwright and cast to stake a claim on a work considered foundational to the Western tradition in a truly universal way. By making Homer their own they remind us that no one owns or directly inherits the past. We all have to find our humanity. 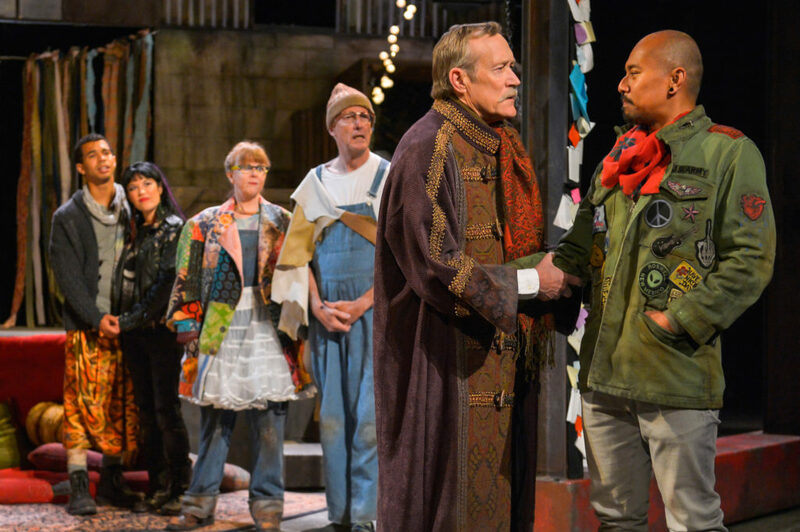 Desdemona Chiang’s smart, contemporary production of As You Like It for CalShakes turns the play inside out, resulting in an extraordinarily moving and revelatory performance. 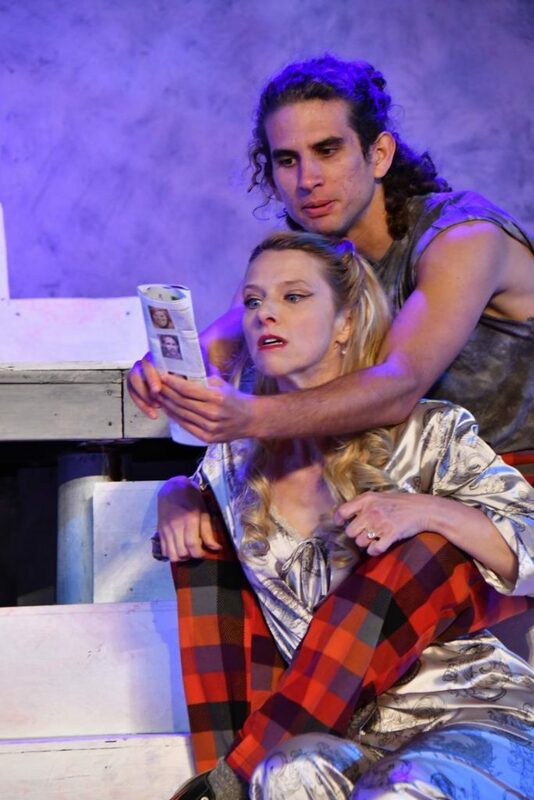 (L to R, front) Jomar Tagatac (seated) as Charles the Wrestler, Patrick Russell as Orlando and Jessika D. Williams as Rosalind photo by Kevin Berne. Chiang takes everything we have come to expect from this pleasant (if usually light-weight) comedy and stands it on its head. From arrival in the auditorium until the curtain call, she finds unexpected depth and intensity by reimagining the setting, the period and the context of the show. 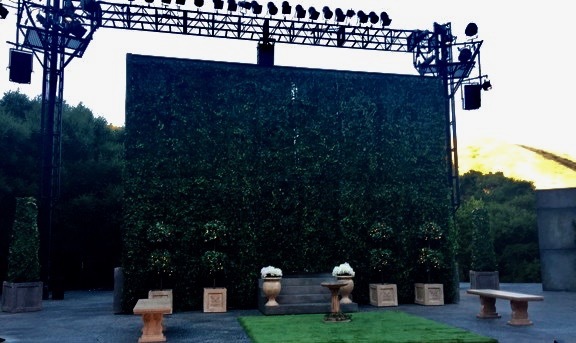 The first glimpse of Nina Ball’s evocative set (waiting on the open stage of CalShakes’ beautiful outdoor location in the foothills just beyond Berkeley) is of a gorgeously manicured ivy-covered wall and topiary garden. Reversing the usual trope, this particular “green world” proves to be the unhappy home of the heroine, rather than the expected idyllic wood to which she will later be forced to flee. Nina Ball’s beautiful “green wall” in the pre-show sunset. When that heroine, Rosalind, is spitefully banished by her malicious uncle, she adopts male disguise and decides to seek her exiled father in the Forest of Arden. Ball’s set revolves and suddenly… we are in a dark, industrial back-alley, where the homeless and dispossessed occupy deserted loading docks stacked high with abandoned shipping containers. It is an apt contemporary analog for the dangerous backwoods of Shakespeare’s era, but unlike any design choice I have previously seen. On the surface level, this resetting is not an easy fit. The rustics in the “woods” retain their pastoral concerns from deer hunting to sheep herding, while Rosalind (along with the cousin and court jester that agreed to accompany her) speak admiringly of the beauty of the place. The urban jungle we see and the idyllic pastoral vista we hear described are jarringly at odds. (L to R) James Carpenter (Duke Senior), Craig Marker (Amiens), Lisa Hori-Garcia (Second Lord), William Thomas Hodgson (First Lord), Patrick Russell (Orlando) and Jomar Tagatac (Jaques) on Nina Ball’s urban jungle set. Chiang’s genius lies in slowly seducing us into an even-greater-than-usual suspension of disbelief so that we might look past these surface discordances and discover the play’s deepest core. Her allies in this are her exceptional design team, which in addition to Ball includes costume designer Melissa Torchia, lighting designer Masha Tsimring and sound designer Sharath Patel. They build a world that looks nothing like what is said to be their location, but feels exactly right for a place that is “uncivilized,” and therefore at once dangerous yet freeing. 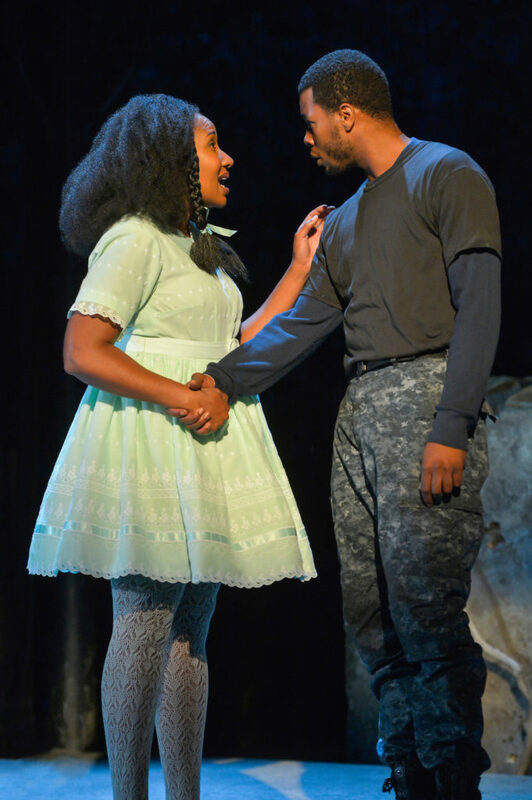 It is the performance of Jessika D. Williams as Rosalind that pushes the production to truly remarkable heights. In this dangerous new environment, her version of the protagonist has good reason to disguise herself as the male Ganymede, but in Williams’ interpretation what begins as a disguise becomes a discovery. Freed from social constraint, her Rosalind is not so much “performing” the part of a man as she is giving up “performing” the role of a woman. She finds a less-limited, stronger version of herself inside her disguise, and she likes it! 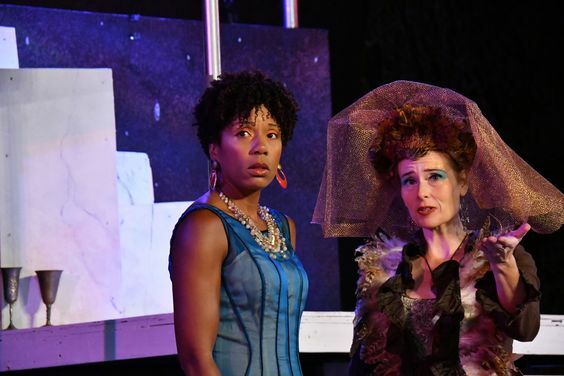 (L to R) Jessika D. Williams (Rosalind), Maryssa Wanlass (Celia), and Patrick Russell (Orlando), photo by Kevin Berne. 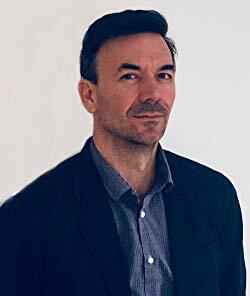 Patrick Russell plays her love interest, Orlando, more conventionally, but he has the courage to play his character as being as attracted to Rosalind’s male alter ego as he is to the “absent” Rosalind. Where he especially shines, however, is in a small scene usually played with a light touch where, penniless and hungry, he demands food at knife-point from a group of homeless people enjoying a communal meal. Rather than make fun of the character’s ineptitude at bluffing, Russell plays the scene with believable, fearful recklessness. Even while bringing sympathy to his character’s desperation, he nonetheless seems genuinely dangerous when holding Jacques hostage. The high point of the evening follows quickly upon this moment. 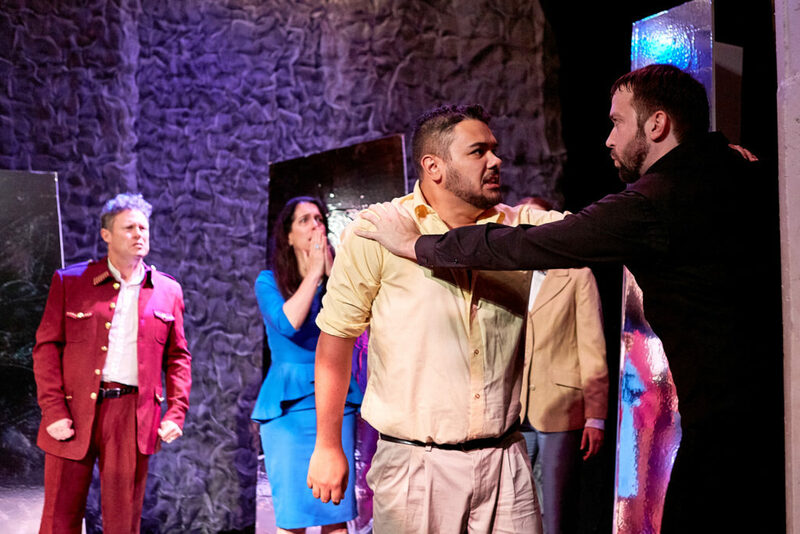 As a man who genuinely believed only moments earlier that he was going to die at Orlando’s hand, Jomar Tagatac delivers the famous “seven ages of man” speech with an immediacy and specificity that made it integral to the play and indescribably moving. As the melancholic Jacques, Tagatac is extraordinary all night long, which is little surprise to anyone who saw his unforgettable turn in Life Is a Dream at the same theatre two summers ago. His performance, alone, is worth the price of your ticket. (L to R) William Thomas Hodgson (Silvius), Lisa Hori-Garcia (Phebe), Patty Gallagher (Audrey), Warren David Keith (Touchstone), James Carpenter (Duke Senior) and Jomar Tagatac (Jaques), photo by Kevin Berne. 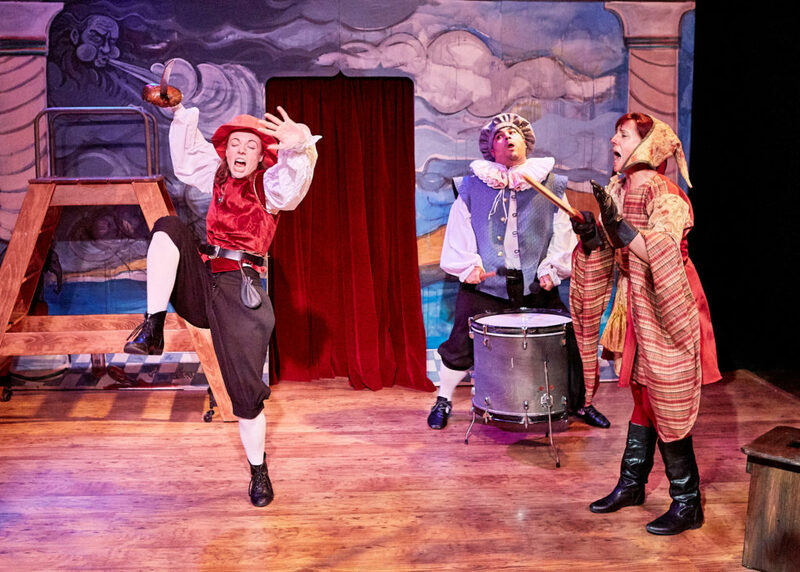 Company stalwarts James Carpenter as both the usurping and deposed dukes, Patty Gallagher as the unsophisticated country- (or in this case, city-) bumpkin, Audrey, and Warren David Keith as the jester, Touchstone, are uniformly wonderful in their supporting parts. Maryssa Wanlass as Celia, Craig Marker as Oliver, William Hodgson as Silvius and Lisa Hori-Garcia as Pheobe complete the cast, in which there is no weak link. The denouement of the play is always a little odd, as the text prominently features a deus ex machina for which we are even more than usually unprepared, but Chiang makes her most deliberate textual changes of the night to this ending by simply eliminating most of it. It is not just her Rosalind who has no desire to change back into a woman. The whole production is most comfortable in the transformative “green world,” and in the end it stays there. After the curtain call, Rosalind’s super hetero-normative epilogue is retained, but so peppered with gender-queer and LGBTQ-friendly asides from the rest of the cast that it ends by meaning exactly the opposite of what it says on paper… thank heaven. 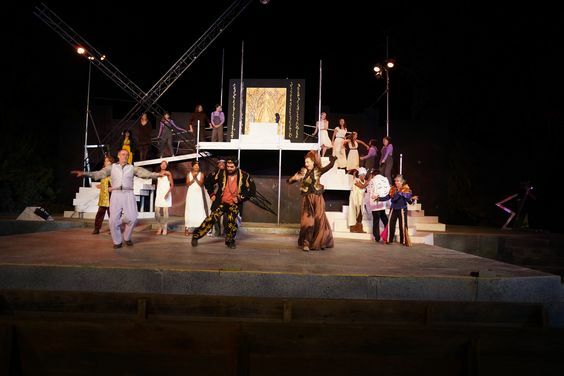 CalShakes is the largest and most sophisticated of the Bay Area’s summer Shakespeare festivals. Its new artistic director, Eric Ting, seems determined to maintain and extend the company’s progressive reputation. 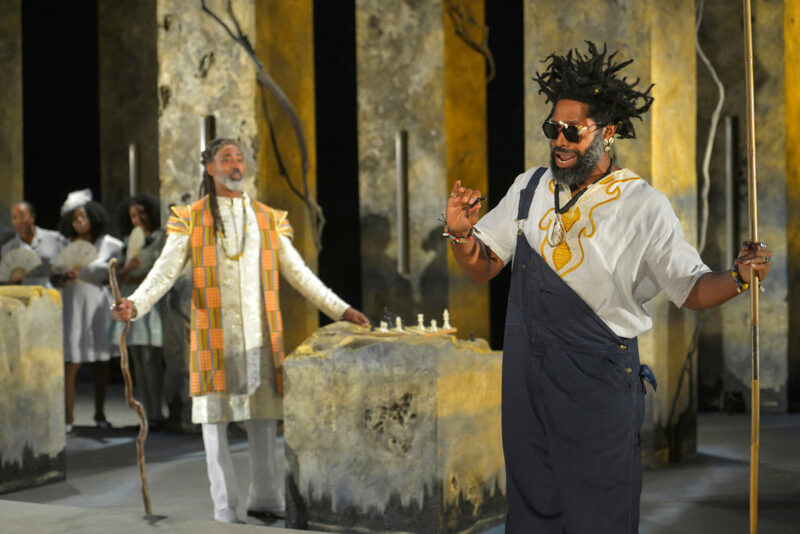 In his own directing debut for the company last season, he produced a notable – and notably controversial – Othello, which was pointedly political, via a hyper-Brechtian performance style. 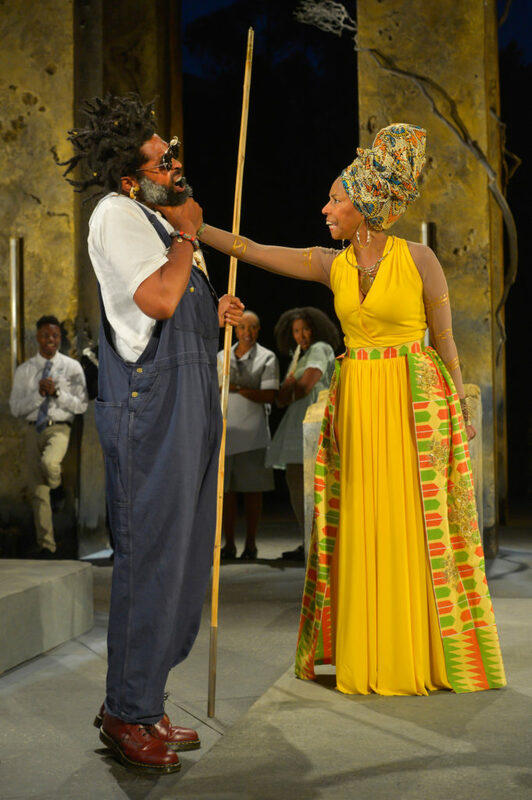 As You Like It goes about making its social commentary in a more indirect way, but is every bit as revolutionary. What a great start to the Shakespeare season!